August is typically a month of well-deserved vacation time for many of us. The Italians lovingly refer to this time of the year as Ferragosto – Assumption Day, a national holiday that is celebrated on August 15 and marks the beginning of a nationwide vacation period. Thanks to a generous departmental summer fellowship I was relieved from any teaching duties this summer and could solely focus on a few research projects. In June I had received an email from Michael Butterworth that invited me to participate in an anthology on Global Sports and Militarism (forthcoming with Routledge in 2016). The symbioses between sports, media, and the military has always been a research interest of mine. My first publication, “Commemorating 9/11 NFL-Style: Insights Into America’s Culture of Militarism” in the Journal of Sport and Social Issues explored the NFL’s commemoration ceremonies on the 10th anniversary of 9/11 as a unique instance of sports–media-military convergence through their meticulous implementation across multiple games, broadcasting channels, and geographic locations. Addressing the valorization of troops, the sanitizing of war, as well as territorial conquest, I argued in this article that the NFL’s 9/11 commemoration ceremonies are complicit in the silent re-empowerment of the neoliberal state in times of perpetual war. Participating in the global sports anthology not only allowed me to take a bit of a break from dissertating this summer, but I was also able to combine my vacation trip to Germany with some work by proposing a chapter on the German army’s ongoing investment in sports for the purpose of nation building, particularly through the figure of the sports soldier. As several high-profile athletes are Bundeswehr soldiers, I scrutinize the symbiotic relationships between the armed forces and German sport associations in light of the Bundeswehr’s attempts to re-brand itself after the suspension of the draft in 2011. Seventy years after the end of World War II, German society opposes unilateral military actions and remains suspicious of attempts to re-militarize the country. Similarly, the display of overtly nationalistic sentiments during sporting competitions still make many Germans uncomfortable. While the presence of different military branches and the honoring of troops during baseball and football games in the U.S. have simply become part of public memorializing post-9/11, a tribute to fallen soldiers of the German army in Afghanistan during a soccer match of the German Bundesliga remains unthinkable. Given the, sometimes fraught, interconnection between sports and militarism in Germany (we only need to think of the 1936 Nazi summer Olympics in Berlin), I interrogate the tactical collusion between sports and military service that the Bundeswehr currently employs to interpellate and recruit diverse German citizens as sports soldiers. 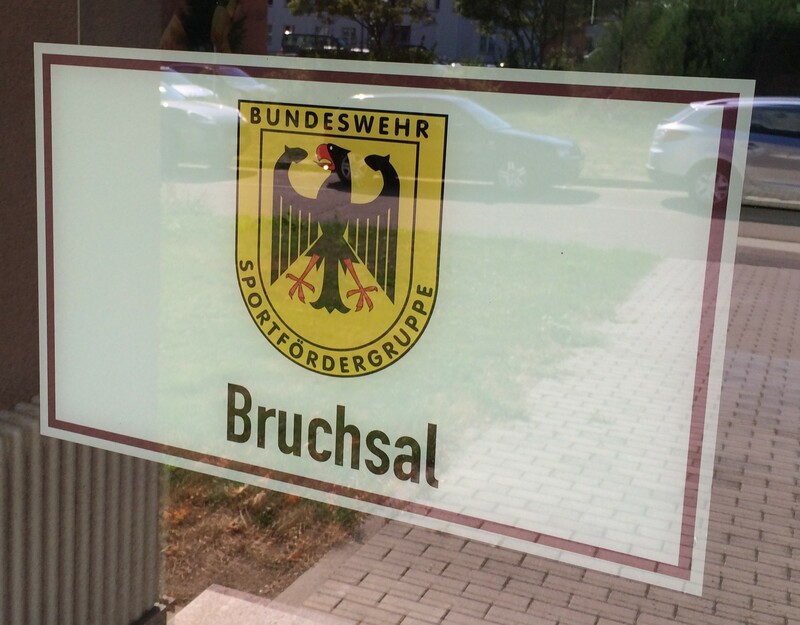 After setting up contacts through the Bundeswehr’s press office and gaining permission from the German Department of Defense I was able to visit an army base in Bruchsal, which is home to one of the 15 special sporting groups that the Bundeswehr supports. Visiting Bruchsal gave me a first sense of what a sports soldier’s daily training and routine looks like. The interviews with four athletes and the head of the sports group were super interesting and very informative. While I have not been able to evaluate all of my recordings – below are few “preliminary findings” from my visit. The Bundeswehr currently provides financial and material support to around 744 top athletes from various disciplines (including, for example, soccer, wrestling, boxing, rowing, parachuting, gymnastics, skiing, and bobsledding to name a few), who are nominated annually by their respective sport associations. Admission into the Bundeswehr cadre is highly selective and extremely competitive. Sports soldiers are typically those who are able to qualify for the Olympics and world championships. Several interviewees repeatedly commented on the pressures they felt to remain in the cadre and deliver top performance year after year. In general, the athletes seemed very happy and proud to call the Bundeswehr their employer. For many German athletes in so called “Randsportarten” – fringe sports – that do not garner enough media attention and support from corporate sponsors (think, for example, about the immense presence of companies such as Nike, Visa, Adidas or Coca Cola during the FIFA World Cup), the Bundeswehr becomes the only means for them to solely focus on their athletic success and development. As a sports soldier athletes are provided with a certain level of financial security and the Bundeswehr also encourages athletes to plan beyond their athletic career by promoting higher education, military service, or job training in the private sector. While all interviewees acknowledged the difficulty of a dual focus on sports and education, several athletes had earned secondary degrees or higher military ranks. The young female weightlifter I spoke with, for example, is currently completing an online BA in sports management. 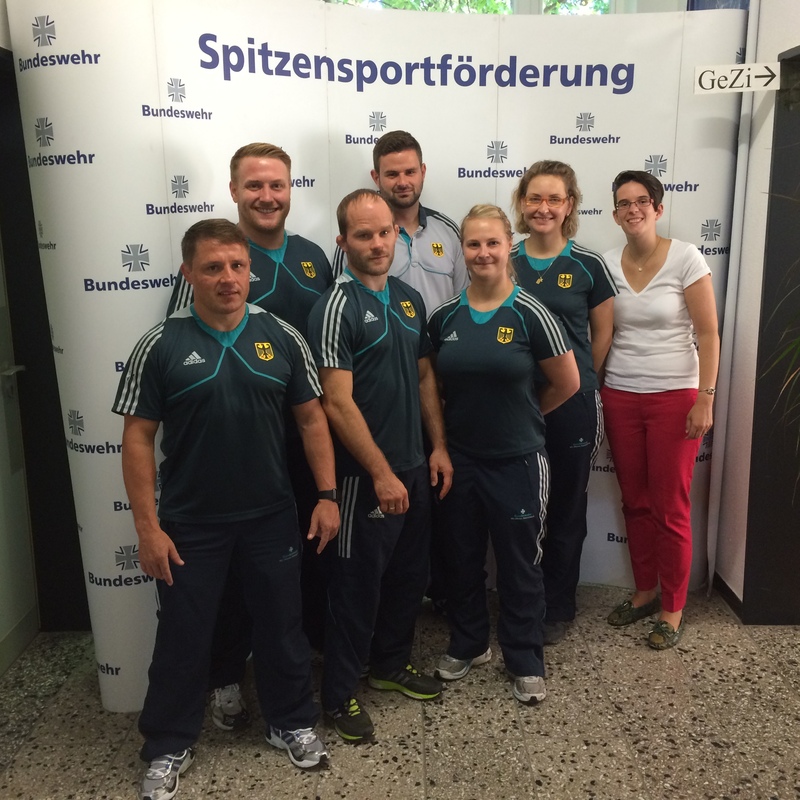 All athletes repeatedly expressed their deep gratitude to be taken care of and be part of the Bundeswehr. While sports soldiers have to complete some basic military training, they do not face the same stipulations of regular soldiers. For example, sports soldiers do not have to live on base, complete extensive military training, or participate in military operations abroad. Nonetheless, the athletes seemed to feel a strong sense of belonging with the regular troops. The wrestler I interviewed, specifically commented on how he enjoyed moral support and entertainment visits with troops stationed abroad and that he regretted not being officially part of those missions. So what does the Bundeswehr gain from supporting sports soldiers with around 32 Million Euros every year? The strategic deployment of sports soldiers for recruitment purposes functioning to (re)brand the Bundeswehr as a fun, welcoming, and inclusive institution – billing itself as “active, attractive, different” certainly demands some critical attention and exploration. Especially because the Bundeswehr, similar to the U.S. military, claims to offer – especially for women and ethnic minorities – equal opportunities and an appealing work environment without addressing persistent issues of racism and sexism, nor the complex issues of participating in ongoing counter-terrorism operations abroad. So much for now but I’ll be sure to post updates as the article develops.